Safe protection of the capacitor element against the mechanical stresses which occur during processing and operation. No danger of delamination, internal cracks or tearing away of the contacts due to similar expansion coefficient and the elasticity of the construction. Excellent self-healing properties of metallized WIMA capacitors due to pressure free layers in the winding element. Flame retardant plastic case in accordance with UL 94 V-0. Clearly defined dimensions allows for close placement and exact setting of parts on PC-boards. Even larger parts are easily robotically insertable. Easy second source because of standardized box size. the capacitor to be tested is connected over a series resistance of R ~ 10 k at with adjustable direct voltage source. the voltage on the capacitor is observed with a line recorder or an oscilloscope (see diagram). the voltage applied to the capacitor is continually increased, over and above the rated voltage for the capacitor, up to the first self-healing process. The line recorder shows clear breakdowns in the capacitor voltage and then recharging until the next self-healing occurs. The voltage rate at the first breakdown and the number of self-healings which happen before the short-circuit finally occurs, allow definite conclusions to be drawn about the capacitor dimensioning or type. This clearly shows that stacked MKT film capacitors short-circuit after a few self-healing processes. Also, the rate of the breakdown voltage is usually distinctly lower. A low loading capacity and a reduced life time are the result. WIMA capacitors, on the other hand, are surprisingly hardy. As well as having very high breakdown voltage, they self-heal much more frequently than corresponding stacked film capacitors. The test clearly proves the high reliability and long life-span of WIMA MKS capacitors, well above the data given in the catalogue. Radio interference suppression capacitors serve to reduce or suppress the HF voltage interference in electronic equipment. The RFI capacitors remain on the mains for an uninterrupted period of 10, 20 or more years and have to both protect the appliance against line-side surge voltages/transients and suppress reactions of the appliance on the mains supply. Transients are voltage spikes to which the mains voltage is subjected and which can easily occur several times a day in low voltage mains supplies with amplitudes of 2000 V and above. Peak values can be as high as 6 kV (figure 1). A = Atmospheric disturbances (lightning flashes, faults in the high voltage system). B = Faults in the mains or in nearby equipment (e.g. faulty fuses, response of power switches). C = Switching on/off of electric equipment (motors, welding sets, household equipment etc.). D = Voltage spikes from equipment like power supplies, inverters, TV-sets etc. Radio interference suppression capacitors are used to block and attenuate these voltage spikes and are defined in X and Y classes according to the demands they have to satisfy. Class X capacitors have unlimited capacitance and are connected between phase to neutral or phase to phase conductors. Class Y capacitors have increased electrical and mechanical safety and are installed between phase conductors and the shock protected earthed casing, thus bridging the insulation of the appliance. Transient voltage spikes strike the load's mains input. The current can easily reach a level of 200 A for a few microseconds. The RFI capacitor offers very little virtual resistance to the high voltage spikes. At the weakest point of the dielectric there is a breakdown and temperatures of several thousand °C can occur in the surrounding area. A metal-free insulated area is created around the breakdown channel. This process is referred to as self-healing. As this process continues, up to 41% of the previously bound carbon is deposited in the form of conductive graphite sediment in the insulated area of plastic film capacitors and forms highly resistive carbon bridges (figure 2). With the accumulation of such damaged areas throughout the life span of the equipment, or because of high energy self-healing processes of the capacitor, the insulation resistance is considerably reduced. This inevitably leads to an increase in the capacitor current, which in turn causes overheating of the component. The gas pressure which is produced in the interior of the capacitor causes the casing to tear open and the gas mixture to ignite and burn for several minutes with a flame similar to that of a welding torch. Even in the case of fire, the capacitor remains so highly resistive that even a mains fuse connected in series does not respond. Metallized paper capacitors are subject to the same physical factors, too. However, in the case of WIMA metallized paper capacitors, the amount of carbon deposited in the form of graphite sediment is 20 times smaller, thanks to the good oxidation balance of the paper dielectric. The insulation area created during the self-healing process is free of carbon bridges, so that minimal short circuits cannot occur (figure 3). An inadmissible rise in temperature because of a decreasing insulating resistance is avoided. The capacitor has regenerated completely.. 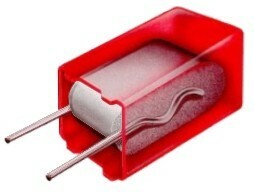 In addition WIMA MP capacitors are fully impregnated under vacuum and encapsulated with self-extinguishing material. There are no air pockets and contact of the capacitor paper with oxygen is not possible. Extensive tests have shown that, even when high energy pulses are applied, WIMA metallized paper capacitors are not actively flammable because of the high breakdown strength and significantly better regeneration behaviour of the metallized paper. The tests, requirements and areas of application of X and Y capacitors are defined in IEC 60384-14, version 2. This international standard which came into force in 1993 is in line with the European EN 132400 and is designed to make national symbols superfluous. The IEC lays down stricter peak voltage tests for several subclasses. Despite the more stringent requirements for peak voltage strength called for by the IEC 60384-14/2, only limited conclusions can be drawn about the safety of radio interference suppression capacitors. A reproduceable test, which also takes a long life-time into account, is the DC-AC test. The DC test simulates the pre-damaging of the capacitor by transients up to the first breakdown. An adjustable DC voltage is continually increased until the capacitor breaks down electrically. The sudden decrease in the voltage indicates the pre-damage of the capacitor (figure 1). Figure 1: Test circuit for DC test. Figure 2: Test circuit for AC test. In the subsequent AC test, the same capacitor is subjected to a stress from zero up to its rated AC voltage at 50/60 Hz. The voltage should be applied to the capacitor for at least 5 minutes (figure 2). The capacitor is considered to have passed the test if it stands up to the DC voltage load and the subsequent AC voltage stress without burning. The test results gained for standard commercial MKT plastic film and metallized paper capacitors are summarized in Table 1. These tests, which were carried out by an independent industrial user, showed that over 30% of the MKT capacitors were actively flammable. Not a single one of the 56 tested MP capacitors was flammable. Table 1: Failure rate of MKT versus MP RFI capacitors. Rated voltage Ur: The rated voltage of a capacitor against a zero potential reference point shall take into consideration that the dielectric strenght of the capacitor film diminishes with rising frequency. The calculation of the required rated voltage of a capacitor must therefore allow for the correction factor k; where k = dielectric strength of the film at the frequency f in % is shown in graph 1. Graph 1: Dielectric strength of Polypropylene film as a factor of frequency (general guide). The calculation of the required dielectric strength is shown in the following example(Umin, Umax have the same polarity). Maximum current: The voltage gradient or rise time of the pulse is taken as the reference point when calculating the maximum current rating of the end contacts. The maximum possible current load on the end contacts is calculated by means of the voltage rise of the pulse (pulse rise time F). for example Ur = 63 V, UPP = 12 V, Fr = 50 V/µsec. x 50 = 262.5 V/µsec. When using maximum current ratings, self-heating must be taken into account at higher frequencies, and must not exceed 8 K.
PV = dissipation in Watts (see table 1 for the max. W per K). ω = 2π x f, where f is the repetition frequency of the pulse waveform. tanδ = dissipation factor corresponding to the frequency of the steepest part of the pulse. Table 1: The data is for ordinary assembly and ventilation conditions avoiding radiant heat within the chassis of the equipment. In applications where reliability is critical, it is recommended to measure the surface temperature of the capacitor and to take into account that the temperature within that capacitor will be approximately 5 K above the case temperature. Determining the permissible AC voltage and AC current at given frequencies. Urms = 280 V (graph 2). Graph 2: Permissible AC voltage in relation to frequency at 10°C internal temperature rise (general guide). must not exceed the maximum current rating specified in the maximum pulse rise time calculation (see Fmax above). In this case, the operating AC voltage is to be reduced accordingly. Calculation is based on an operating temperature < +60°C unless other data is given by the user. Value from the table "pulse rise time WIMA FKP 1": 7000 V/µsec. The calculated voltage gradient is lower than the permissible value shown in the catalogue for this capacitor. Pulse width = 15 µsec = 1 cycle. Pd = 852 x 2π x 32 x 103 x 0.1 x 10-6 x 10 x 10-4 ~ 0.145 Watts. The temperature rise plus the max. ambient temperature = max. permissible operating temperature (taking into account the voltage derating in the (Electrical Data WIMA FKP 1). If the permissible temperature is exceeded, then select a capacitor with a higher voltage rating. Alternatively, our engineers will submit their recommendations upon receipt of voltage and current oscillogrammes. Questionnaire available on demand at WIMA Sales Office by phone +49 621 86295-0 or e-mail sales@wima.de. Depending on the construction, an alternating current in the capacitor winding creates a more or less distinctive magnetic field which can be measured as inductance messen lässt. Modern plastic film capacitors are contacted over the whole end surface of the winding element. In this way the self-inductance of the winding element is short-circuited. The self-inductance is reduced to the PCM (0.8 nH/mm) and the remaining length of the terminating wires (in case of SMD capacitors the distance between the soldering plates). Increasing winding lengths in relation to the capacitance result in a large bonding area and guarantee low ESR values. Thus plastic film capacitors stand out because of their HF properties which are the same as or better than those of ceramic capacitors of comparable size. Impedance with temperature can be neglected with film capacitors but is remarkable with ceramic capacitors. With film technology there is no difference between stacked or wound versions. Marking of WIMA SMD capacitors was gradually ceased as of July 2003. Identification is possible by the labelling of packages and delivery notes respectively. In general, WIMA through-hole capacitors are marked on the front side of the box in plain text with brand name, capacitor series, capacitance, nominal voltage, date code and tolerance. Capacitors with PCM smaller than 15 mm will have the tolerance indicated on the reverse. Standard tolerance 20% is not marked. The second letter "K" stands for plastic film capacitors. The numbers following are WIMA-specific markings. Metallized paper capacitors are marked with "MP". The cases of 2.5 mm and 5 mm capacitors are too small to imprint with the series type (i.e. MKS 2, FKS 2 etc.). Instead, these capacitors must be identified by different colours of the marking inks. After the discontinuation of Polycarbonate film (end of 2000) as a capacitor dielectric by the only manufacturer, Bayer AG/Germany, we have removed all MKC ranges (metallized construction) and FKC ranges (film/foil construction) using this capacitor film from our range of products latest after inventory of film has run out. However, the question of which capacitors can be used to replace the PC series is still of interest. The following comparisons may be of assistance in making decisions. The special feature of Polycarbonate (PC) capacitors is the almost constant course of capacitance drift versus temperature and the suitability for special applications in the field of higher frequencies respectively. Results: In the field of normal application temperature 0/+20 to +80°C Polyester (PET) shows a comparable linearity of the capacitance course in the positive field in comparison with Polycarbonate (PC) which shows a slightly negative course. The capacitance inconstancy versus time is basically identical with both dielectrics. Note: size comparisons between series are possible for the most parts. Results: in comparison to Polycarbonate (PC), Polypropylene (PP) has a lower dissipation factor throughout the course of the whole temperature field. The origins of radial box film capacitor technology lie in radial dipped film technology, which was first developed by WIMA and other European manufacturers in the early-middle 1960s. The radial design offered obvious advantages over the axial design. These included board real estate savings as well as improved electrical performance (lower ESR and self inductance) and did not require the pins to be bent in order for the part to be inserted on the printed circuit board. The poreous epoxy coating of radial dipped film capacitors cannot be expected to provide reliable humidity protection where moderate to severe humidity conditions exist, even when potting compound such as bitumen is used. In addition, since there is no clearly defined seating plane, components rest on the "laquered pants" that can and do develop fissures at the pin exit points when parts are automatically inserted, thus further compromising their ability to resist the effects of humidity. Radial box film capacitor provides uniform dimensions for purposes of optimizing space and second sourcing. Further, it allows for greater flexibility in automatic insertion including robotic insertion of larger parts. Since radial dipped film capacitors rest on their pins rather than on the case or "standoff-feet", any vibration that the capacitor element may be experiencing will be transmitted through the pins to the solder joints. This is of particular concern in AC applications where self-generated electro-mechanical vibrations accelerate the ageing of the solder joints. The extremely thin covering, plus the presence of air pockets contained within the coating, makes the dipped film packaging of doubtful value with regard to passive and active flammability. This is especially the case when the applications does not use any potting compound. On the other hand, the mechanical integrity of the box and cast resin technology provides a high level of flammability resistance when the capacitor is used in AC applications such as in a power line filter or in series with the lamp. Basically all plastic film dielectrics are flammable. Only encapsulation protects the capacitor against fire. When radial box film capacitors are used, the need for potting disappears, since the box capacitor provides sufficient humidity and flammability protection, as well as mechanical integrity, in the face of externally or internally generated shock and vibration. The need for qualified capacitor applications to operate for many years without the maintenance or replacement in often times difficult environmental and operating conditions, makes it critical that the components meet the highest standards of packaging technology. Without such standards, safe and reliable operation over the life of the product cannot be guaranteed. The box film technology is designed to meet this challenge both in radial and SMD version. The trend of modern semiconductor technology towards increasingly powerful applications results in the fact that switched currents and voltage levels are continuously increased and that simultaneously the switching speed is also increasing markedly. The developments in the area of power semiconductors include the component group IGBT (Insulated Gate Bipolar Transistor) or IGBT modules. The switching capacity with shortest switching times which can be realized using IGBTs necessitates an extremely low-inductance circuit design. Even the low self-inductance of the power bus may induce dangerous voltage overshoots between collector and emitter which may result in the destruction of the valuable power semiconductors. Typical voltage overshoot during switch-off. To protect the components, so-called snubber suppressor circuits are used. The most important component in this respect is a low-inductance pulse capacitor in order to attenuate or cut off peak voltages. In general, three basic snubber circuits are used with IGBTs. In order to minimize self-inductance it is of importance to be able to install the capacitor as close as possible to the power semiconductor to be protected. Furthermore, a high mechanical stability is necessary due to the often rough environmental conditions existing in industrial applications. 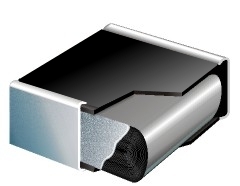 Based on long experience with Polypropylene pulse capacitors in all conceivable applications, the series WIMA Snubber MKP and WIMA Snubber FKP were developed to meet the demands of high-power converter technology and are state-of-the-art components with regard to quality, reliability, and electrical performance. Production sites ISO 9001:2015 certified. All WIMA capacitors, irrespective of whether through-hole devices or SMD, are made of environmentally friendly materials. Neither during manufacture nor in the product itself any toxic substances are used, e.g.